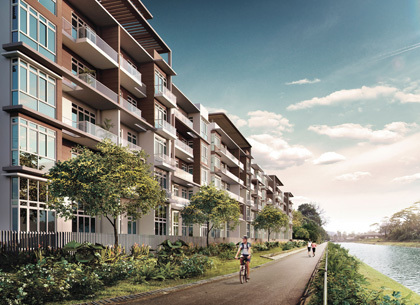 An inviting waterfront residence that makes for an idyllic lifestyle, Waterfront @ Faber presents a rare collection of strata landed homes and condominium apartments in an exclusive neighbourhood. With its good location in Clementi, straddled between the Jurong Lake district and One North, Waterfront @ Faber presents the best of two worlds. Wake up to the mesmerising beauty of nature; experience the peaceful serenity of Sungei Ulu Pandan that flows alongside the development and be amazed by Nature’s abundance of fauna and flora. Just a stone’s throw away, a vibrant world awaits at Jurong gateway. This is the CBD of the West, the new commercial hub that radiates with shiny new opportunities – shopping, dining, entertainment, medical establishment, offices and more. Waterfront @ Faber is a sound investment not to be missed, be poised to benefit from rental opportunities from working professionals at One North’s R&D offices and students from NUS. Your opportunity is here, harness the potential of Waterfront @ Faber.